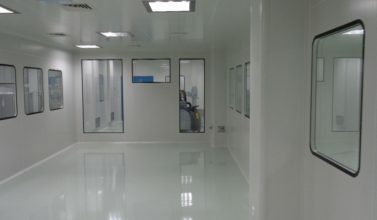 Over the last few years, a number of small and big advancements and innovations that have taken place in cleanroom technology that pharmaceutical and biotech companies can take advantage of to get the most out of their cleanroom equipment. While Fabtech offers all of these innovations as standard execution, their benefits are not commonly known. Here is a list of crucial innovations every pharmaceutical and biotech company should know about. The definitive advantages of fans and motors with EC technology as compared to conventional asynchronous motors lies in their significantly higher efficiency of up to 90% as opposed to 20-70% with AC motors. This ensures a better use of primary energy, less heat and a longer service life. With EC technology you can save upto 30% energy on average. EC technology is a unique, future proof technology that can be monitored centrally via a Building Management System ensuring no outside manipulations and errors. It has minimal noise emissions and can be used anywhere in the world due to wide voltage input range. It is designed for velocities between 0 – 1600 cfm, but usage scales up or down depending on the requirement. This is particularly relevant when filters get old and more velocity is needed to increase the lifespan of the HEPA filter. The use of gel to seal HEPA filters to housings holding frames and grids is an increasingly popular option. Gel materials are soft, and making them the optimal choice to seal filter installations easily. They require lower clamping pressure as compared to typical foam gasket systems. These contamination control systems are for the protection of the operator’s respiratory system from inhalation hazards during de-gowning. They can be used at de-gowning/exit points in facilities where highly potent molecules are manufactured/used as raw materials. When the operator removes their protective clothing (PPE) they also take off the primary personal protection (respirator) at the same time. The mist shower reduces possible re-suspension of hazardous particulates in the operator’s breathing zone and contamination into the de-gowning area. It works by gently wetting the surface of the operator’s protective gown with a fine water mist, causing the powder to stick to the surface instead of becoming airborne. 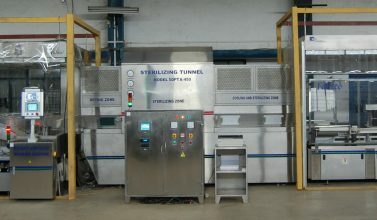 For the equipment to be effective the operator must follow correct misting procedures and the facility’s de-gowning procedure. 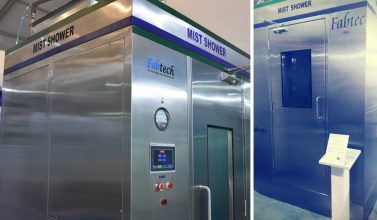 The mist shower’s effectiveness of at wetting particulates is dependent upon misting cycle duration time, the physical and chemical properties of the particulates, operator technique while misting and on the material and design on the protective garments. This game-changing application involves material being weighed and loaded directly onto the de-dusting tunnel from where it is passed online directly into the sampling booth. Materials are sampled and sent onward into the production area. Online Sampling is one of the most preferred next-gen methodologies in parental and solid oral manufacturing. Sampling systems are designed to provide Class 100 working environment at rest with a built-in scavenging system to ensure protection to the product, operator and the immediate environment. Centralised control operations ensure all material passing through the system can be weighed, and precise readings of sample and material data documented and available as needed. Given the evolving challenges that Pharma companies are faced with and new challenges in terms of product and person handling, Fabtech carefully studies the applications and develops customised solutions that are best suited for the requirement. All our cleanroom equipment is manufactured in-house at our at our state-of-the-art facilities. Fill out this form for more information on our many innovations.